Comics Britannia is a three-part BBC4 television series celebrating the classic British comic strips of the past 70 years. First broadcast in September 2007, the series featured interviews with the creators of iconic characters from The Beano, Bunty, Commando, Viz, 2000AD and more. 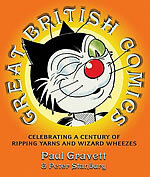 Paul Gravett contributed a series of three articles to supplement each programme, which were originally featured on the BBC4 dedicated Comics Britannia website, as well as appearing as a ‘Comics Brainiac’ on the programme itself. 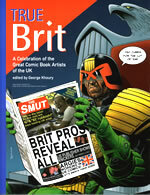 Discover more about Britain’s amazing comics - including full pages of beautifully reproduced original artwork - in the lavish, large format Gravett & Stanbury compendium Great British Comics: Celebrating A Century Of Ripping Yearns & Wizard Wheezes, full of all your favourites past and present and the perfect Christmas comics gift for the whole family! Nylons and chewing gum weren’t the only temptations that American troops brought over to Britain during and after WWII. They also brought their sometimes lurid comic books, which British publishers took to reprinting and imitating. Lancashire vicar Marcus Morris was among the great and the good concerned about the effects of these ‘horror comics’ on impressionable youngsters. 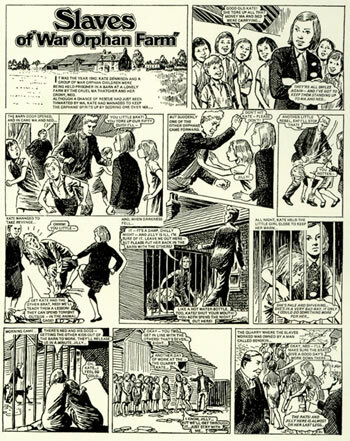 At the time, the clergyman had teamed with talented local artist Frank Hampson to propose a strip to The Sunday Empire News about an East End padre named Lex Christian. 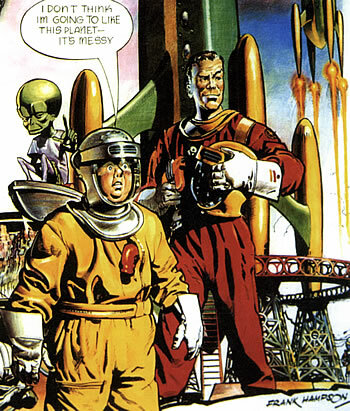 When the editor’s accidental death put an end to their character, Morris and Hampson relocated him to the future and renamed him Chaplain Dan Dare of the Interplanet Space Fleet for their new national strip cartoon weekly. Dare would soon lose his dog collar to became a Pilot of the Future and was signed up by Hulton Press as the front-page star of Eagle. Morris and Hampson’s smart photogravure-printed comic was thoroughly wholesome and educational, extolling Christian values, its name inspired by a church lectern. Hampson directed a studio of assistants to complete his two painted pages of Dan Dare each week, even roping in his father and son to pose for reference photos and giving Dare his own unusual eyebrows scarred in the war. Hampson’s optimistic vision of Britain’s destiny in space was colourfully vivid and convincing and ensured that the first Eagle flew off the newsstands on 14 April 1950, snapped up by nearly one million children. While Eagle appealed mainly to boys, a month later School Friend refreshed the traditions of boarding school tales in girls’ story papers and ushered in a new era of comics for girls. 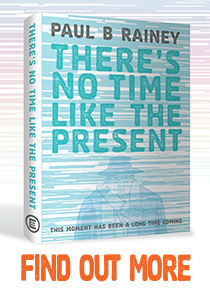 The million-selling first issue cover, which was illustrated by Evelyn Flinders, featured The Silent Three at St Kit’s, sleuthing in their capes and cowls. Marcus Morris competed in 1951 with an Eagle for girls entitled simply Girl, full of inspiring role models and career advice. In 1958, Bunty (from Beano publishers DC Thomson) introduced more working-class heroines, notably the fourth of The Four Marys. Mary Simpson or Simpy was an ordinary but bright state-school scholarship winner who was accepted to the expensive St Elmo’s public school. While quite a few girls read boys’ comics, most boys avoided ‘soppy’ girls’ ones, as the gender gap in British comics deepened. 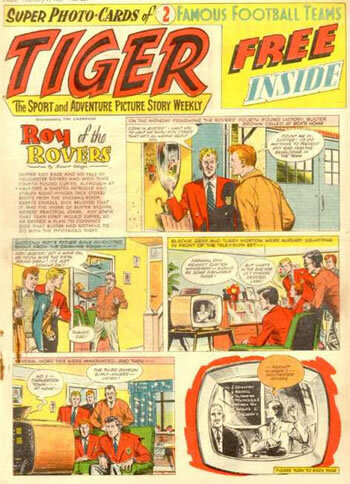 Boys preferred to act out their dreams of triumphs on the battlefield and playing field through the gung-ho but gore-free Commando, last survivor of a battalion of pocket-sized picture libraries, and through the goal-scoring genius of Roy of the Rovers, kicking off in Tiger in 1954. Whatever the setbacks, victory against the Nazis or the opposing team was assured. 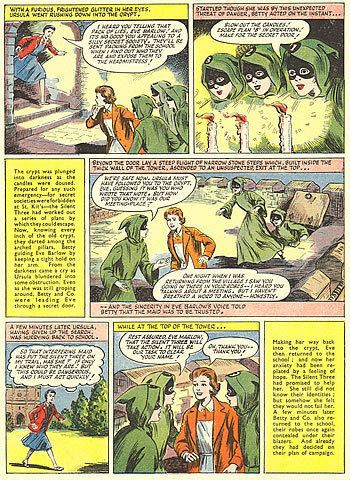 By the late 1950s, teenage girls - growing up faster than boys - found their fantasies answered in a rush of romance comics, such as Mirabelle, Romeo, Cherie, Valentine and Roxy. Several featured comics based on hit records, some involving the pop stars themselves. All the heartache and tears would usually be resolved by true love and a final tender clinch with Mr Right. In 1964, the thoroughly modern Jackie, named after author Jacqueline Wilson, a Thomson’s newspaper reporter at the time, brought a taste of the Swinging Sixties and women’s magazines into weekly comics for younger girls. Jackie was more than a comic or magazine; it became the readers’ friend, confidante and surrogate parent, from whom they could seek advice on how far to go with boyfriends and other adolescent anxieties. Times and tastes were changing and by the early 1970s once-proven formulas were losing their appeal. The next revolution in comics actually took place in a girls’ title, when writer Gerry Finley-Day started Tammy in 1972. Understanding that girls loved being made to cry, Finley-Day cranked up the cruelties heaped on his long-suffering heroines and pioneered a darker, more disturbing approach to girls’ drama stories. Hit serials such as Slaves from War Orphan Farm proved so riveting and successful that the style spread to other girls’ titles from IPC as well as rivals Thomson. Later in the 1970s, it also spurred writer Pat Mills to increase the spooky chills in Misty - he realised that girls also loved being scared. In a strange way British comics were almost harking back to the tricks once used in 1950s horror comics, albeit in a much milder form. Jackie and other slightly older teenage titles such as Mates and My Guy revived the Photo Love strip format, employing a young Hugh Grant, George Michael and other future stars to play the romantic leads. Mills is not alone in considering Finley-Day’s innovations on Tammy as crucial in founding modern British comics by introducing the grittier realism and more down-to-earth characters that would also transform and reinvigorate boys’ comics. 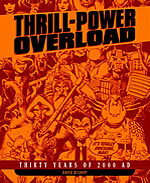 Without him, Mills might never have devised IPC’s three most significant boys’ titles of the decade: Battle, Action and 2000AD. Battle was started in 1976, and it was here that Mills was first able to convey the true horrors of combat. He plunged young readers into the trenches of WWI as seen through the eyes, and the letters to and from home, of a boy much like themselves: an underage, working-class Cockney recruit named Charley Bourne. 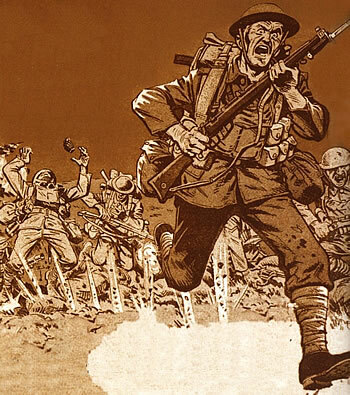 Grounded in research and brilliantly illustrated by Joe Colquhoun, Charley’s War was unprecedented in deglamourising and humanising the war genre and heralded further changes and controversies to come as comics continued to change with the times. This article originally appeared as part of the BBC 4 television Comics Britannia season in September 2007 celebrating UK comics. This article appeared on the dedicated BBC4 Comics Britannia web-site.